For décor, I knew I wanted some high impact wall pieces as well as a few little touches here and there. I had seen a few tutorials for giant wall prints online, but found the tutorial over at Infarrantly Creative to be most helpful. (Remember, I started everything the night before the party, so I can vouch that this isn’t that time intensive of a project!) 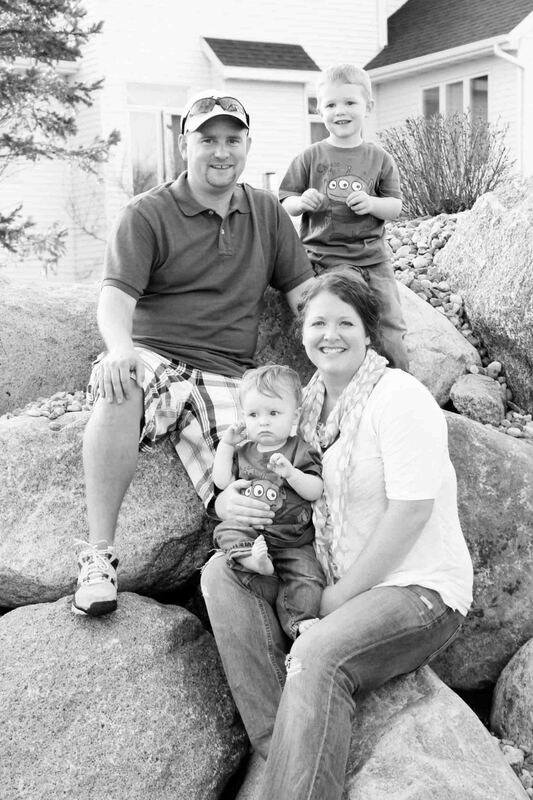 Then I created a little photo banner/garland featuring four photos of each boy from previous milestones. If I was really on top of it, I’d have had photos for each month at least for Grayson, my youngest who turned one, but I’m clearly not that on top of it! My wonderful Aunt came down the night before to help when she heard the overwhelming amount of stuff I wanted to accomplish. She is a whiz at sewing (I’m not even sure I could sew a button) and whipped out the monster pillows that I also used as little party favors for my nieces. They were loved by all! One of the last things I did was decorate our front door. 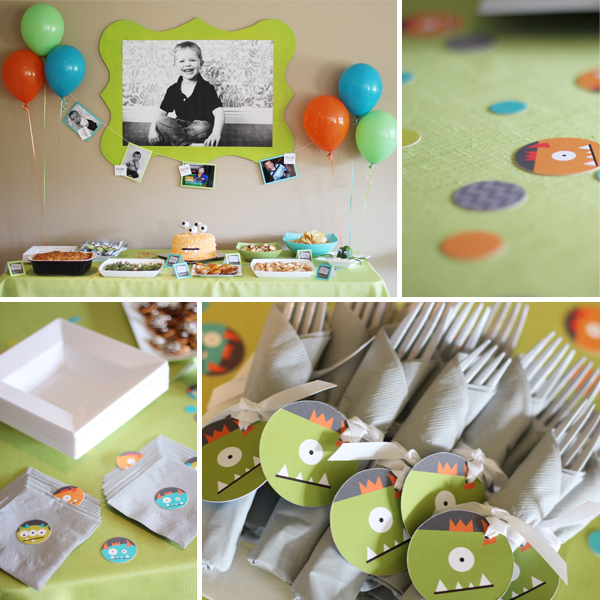 With a plastic tablecloth from the party store and construction paper teeth and googly eyes, it really set the Monster party theme for all our guests! We ended up with far too much food and treats, so there wasn’t too much room left on the table to decorate, which was actually perfect. Pear Tree is working on a new product line, personalized confetti (coming soon), so I was able to get an advance order to sprinkle on the table (one of the perks of being an employee!). 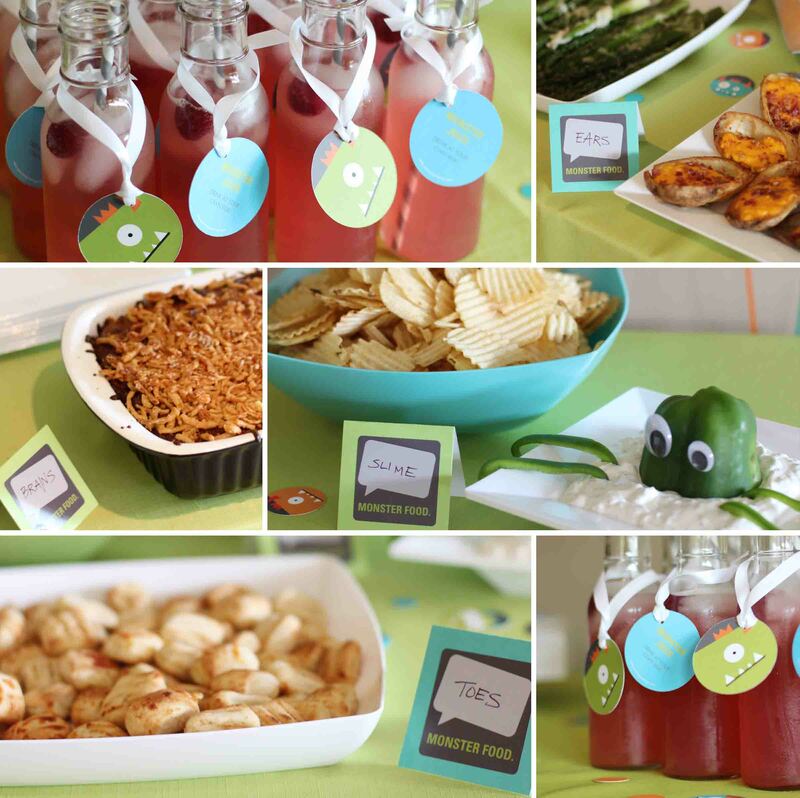 I also ordered Monster Favor Tags to tie around the napkin and flatware sets. Loved how the tables turned out, and they were both set under one of the giant wall frames. Did I mention we had plenty of food and treats? A fellow Pear Tree colleague made the cakes and cupcakes, and a previous co-worker made the cookies. I’ll let you pause for a moment and review the photos and how amazing the cookies and cakes were. That’s my little guy in the middle, he definitely approved of the cake! 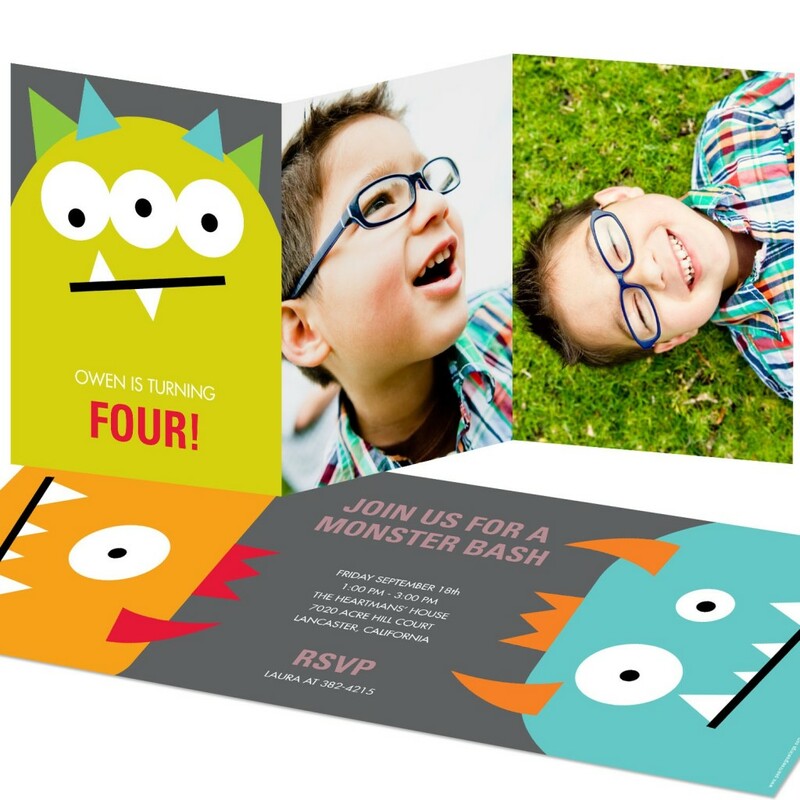 I absolutely loved reading this blog, I saw your pictures in an email I received from ‘Pear Tree Greetings.’ The party you put together for your two adorable children looked amazing and by the looks of all those smiles, was a lot of fun too! My sister who has two children puts together the most amazing parties for her children so I’ll have to send her this link, I’m sure she’ll enjoy it. Wishing you and your family all the love and happiness! Thank you, Nicole! I had so much fun putting everything together! OMG, that is so awesome! I hope I can come with something super cool like you when my son gets older. He’s only 15 months; so, it’s long way from now. Thank you! I am positive you can come up with something great for your son’s birthday party. I would just suggest starting sooner than the night before the party. Thanks again for your comment! Sarah, your party was amazing! You did such a great job on all of the details, love the monster shirts and hats! Thanks for sharing your party with us! So freaking cute! 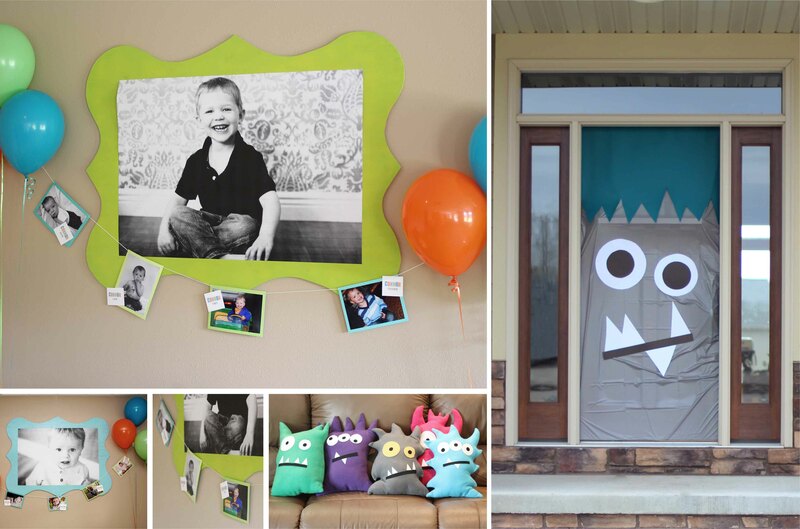 I may plan a monster theme birthday party for my mom next week! We love sewing little felt monsters! Exciting! The little felt monsters were and still are a hit! This is just adorable. 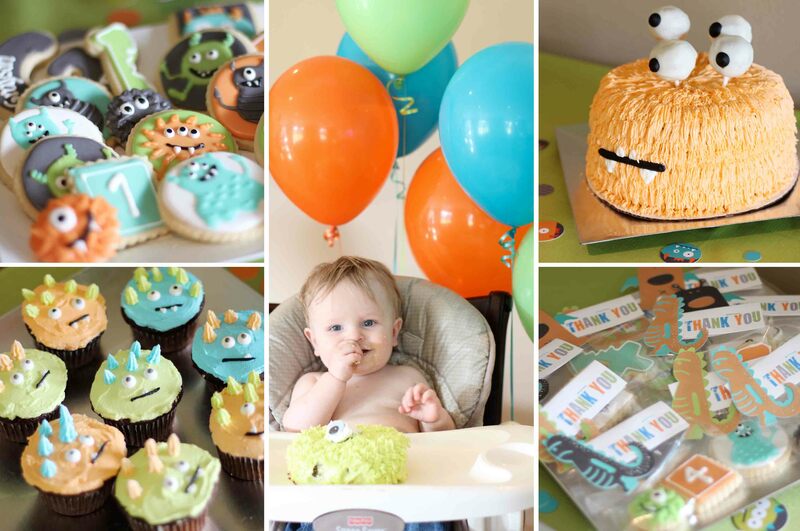 The way to make a birthday party perfect for children is to cater to their specific likes and dreams! So a fairy theme or princess theme is great for the little girl that loves those things. Once you find the right theme, the next step is decor and games! This is a perfect example of that. Absolutely, Leslie! Thanks for the comment!